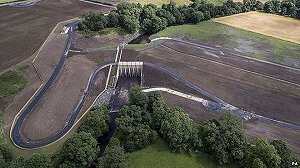 A flood scheme – hailed as one of the largest projects of its kind built by the Environment Agency - has opened in Morpeth this week. It has been designed to protect local residents by storing up to 1.4 million gallons of flood water upstream. The project has been jointly delivered by the Environment Agency and Northumberland County Council, which provided £12m in funding. Work on the scheme commenced in 2013 and included a new flood wall and embankment and three new flood gates. Repairs and improvements to existing defences have also been carried out. The scheme follows damage to over 1000 properties in 2008, caused by severe weather with prolonged rainfall which flooded the town and forced hundreds of people to evacuate. Over 1000 homes and business in the North East town will now benefit from the scheme which will work by storing up to 560 Olympic-sized swimming pools’ worth of water when river levels are high. Chairman of the Environment Agency, Sir Phillip Dilley, said: “With one in six people at risk of flooding in England, flood schemes like Morpeth have a key role to play in protecting people and property, and provide a valuable boost to the local economy. “The success of this scheme is down to the way it has been developed in collaboration with others. In particular, the funding from Northumberland County Council is among the largest contributions ever received under the partnership funding regime. Read our update on the National Flood Resilience Review 2016 here.